Disney's Frozen Bouncer is Hot! 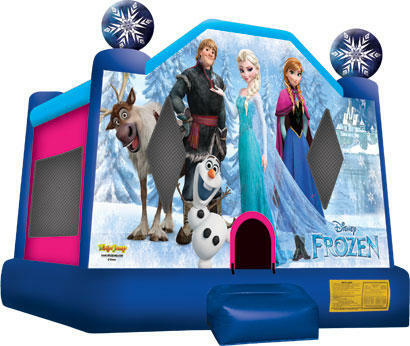 Planning on having a Disney Frozen Theme Party, rent this beautiful and colorful Disney Frozen bouncy house for the princess in your life. This will make your Frozen theme party complete. Your kids will love this units colorful licensed Disney Graphics of Ana, Elsa, Hans,And of course Olaf. This bouncer also features large netted vent windows to keep things cool inside while parents keep an eye on the activity, and an inflatable safety ramp at the entrance to protect excited children entering and exiting the bounce area. The size of this inflatable is 13ft wide by 14ft long and 15ft tall.